DealDash Review: Is It A Waste Of Time And Money? Home Online Auction Sites DealDash Review: Is It A Waste Of Time And Money? You may have seen television commercials promoting opportunities to win merchandise at deep discounts on DealDash. The website allows you to bid on merchandise, such as jewelry, bed linens, outdoor items, or you can win additional bids as well. Before signing up for an account, you should learn how the website works. DealDash is a penny auction website that began operating in 2009. Their goal was to make online auctions fairer, so people didn’t lose their money, become disappointed, and stop using them. Some of the things they implemented were to get bids back if you didn’t win an auction and bought the item instead. Also, they provide a money back guarantee for the first bid pack purchase on DealDash. If a player doesn’t like the format, a refund can be requested on the purchase. What’s So Good About DealDash? DealDash offers a large variety of merchandise, additional bids, or gift cards for auction on their website. Since DealDash is a penny auction, every time someone places a bid on an item, its price goes up by one cent. One cent is the maximum the price can go up so that no higher bids can be placed on items. Before bids can be placed, you must create a free account on the site. When a bid is placed, not only does the price increase by one cent, but 10 seconds is added to the auction’s timer. Adding time gives others a chance to place a counterbid and for DealDash to make more money. If no further bids are forthcoming when the last one is placed, the timer will run out, and the last bidder wins the auction. A bid pack contains bids in certain increments, such as 50, 100, 250, etc. When you buy one, you pay a per bid price for it. So, if bids are on sale at 13 cents a piece and you buy a bid pack containing 100 bids, then you pay $13 for the pack. However, bids can be as high as 60 cents apiece so that you would pay $60 for a 100-bid pick. 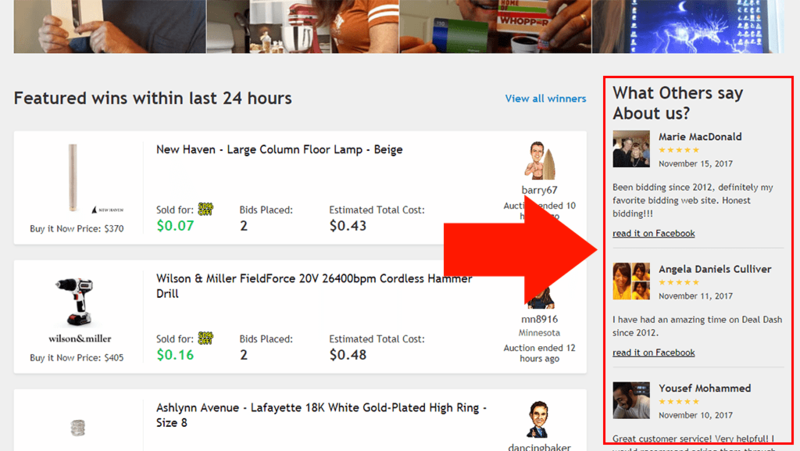 When you participate in an auction, you can either watch it live and place bids by pressing the "Bid Now" button, or they can be placed automatically with the “Bid Buddy.” When you use the Bid Buddy, you set how many bids you want to make on an item during an auction. Then, it makes those bids during the best time in the auction, which is usually within the final seconds of it. Every time you’re the highest bidder in an auction using Bid Buddy, you gain time. There is a time meter at the bottom of the screen on your computer or mobile device that shows how much time you have accumulated. When the time meter fills up, then you win free bids. When a bid is placed, then it is deducted from your bid pack. Also, keep in mind that every bid on an item increases it only by one cent, so you would pay the bid price of 60 cents (or whatever the cost per bid is) to try to win the item. So, if you placed 15 bids in an auction, you only increase the price by 15 cents for the item, but you will have paid up to $9 if each bid cost 60 cents. If you don’t win the auction, then you can get a refund of your $9 by buying the item outright. However, you will pay the value cost of the item and not the bid price. When you win an auction or buy a product outright, it is shipped directly to you through the vendor, such as Walmart or Sears. The order can be tracked through the “My Orders” page on the website. There are no shipping costs, and if the product is defective, damaged during shipping, or doesn’t match the description of the item you bought or won, the return shipping is free as well. ​This feature allows you to set the number of bids on an item that you want to place during an auction, and it will bid for you, so you don't need be present during auctions. ​Free bids can be won by using Bid Buddy and filling up the time meter on your account. Bidders can also get free bids by reaching new levels on the website. ​Some auctions will offer items for 50% off the final bid price when you win the auction. The promotion is for auctions that start during the “50% Off” promotion. ​A new feature on DealDash is the ability to accumulate badges by performing certain tasks. If you win a certain number of auctions, you can win a badge and free bids. If you post a review, using the DealDash app on your smartphone, or finish in second place on an auction, you can earn badges. However, not all badges come with free bids, you just accumulate one of 26 badges. By bidding on DealDash, people can purchase some merchandise at a discounted price. Whether they win an auction or buy the merchandise outright, they not only save money on the item, but there is no cost for shipping it directly to their homes. They also accept VISA, VISA Electron, or Maestro debit cards. Payments can also be paid through PayPal. Unless you live in Minnesota or Illinois, you will not pay sales tax on items. Also, shipping is free whenever you win an auction or choose an item through the “Buy it Now” option. DealDash is not an international site, even though the company is international. The only people who can place bids or win them are from the United States. However, Americans should be aware that the only places the website ships merchandise to are the lower 48 states. They do not ship to Hawaii, Alaska, or anywhere else in the world. Also, users should read the site’s information, such as the House Rules, how to place bids, and the site’s terms and conditions. It is also wise to understand how much you will pay for items before you start bidding. For instance, if you win an auction for an item that costs $10, but you placed 10 bids at 60 cents each, you will end up paying $16 for that item. Since each bid costs 60 cents and you placed 10 bids, that is $6. Add that to the end price of $10 for a total of $16 that you will owe for the product. Some of the gift cards the site offers are obscure online businesses instead of well-known stores like Walmart, Sears, or popular restaurants. They offer gift cards from companies like Total Trivia, Swap.com, or The Barrel Shack instead. If you have an issue with a product you receive, such as it was damaged during delivery to you, or you want a refund on your first bid pack, then you would need to contact customer service. There is a large contact support button in yellow on the bottom right-hand side of the page. Customer support can be contacted through email, by writing their address in Minneapolis, MN or by using their online chat option. While customer service is often rated two to three stars on some review websites, which are sites where former or current customers write reviews, there weren't any major complaints about not being able to contact them. The main complaint was not having a request fulfilled by customer service, such as getting a refund on bid packs. When a credit or debit card is used to pay for bids or to buy a product, the site uses SSL encryption to keep customer’s personal and financial information safe. If you do suspect fraud, you can contact DealDash through their customer service department or your card’s customer service department. The perception of DealDash varies between those you think it is a scam and those who like bidding on it. For people who tried the site and were unhappy with it, there are mostly upset by continually being outbid on items. Many people also complained about needing to pay for the item after they had bid and won the auction. On the other hand, there were many people who liked using the site and said they would return to it. They enjoyed the quality of the merchandise and understood the bidding process. They also complimented the website for how quickly they received their items. While the testimonials on DealDash are mostly positive, there are review sites that you can visit for both positive and negative reviews. Reading them can help you decide whether to invest your time and money on the site or skip it. Before placing bids, it is important to understand how the bidding process works. The bids are not how products are bought. They simply allow you to bid on the site and in auctions. The final price, or the winning bid, will be the price you pay for the merchandise, in addition to the number of bids you place. Without understanding this bidding process, it is easy to see why some people may think a site like DealDash is a scam. The best way to understand the process is to read all the information on their website and some of the reviews because some reviewers will provide tips for bidding on the site to help others understand the process. 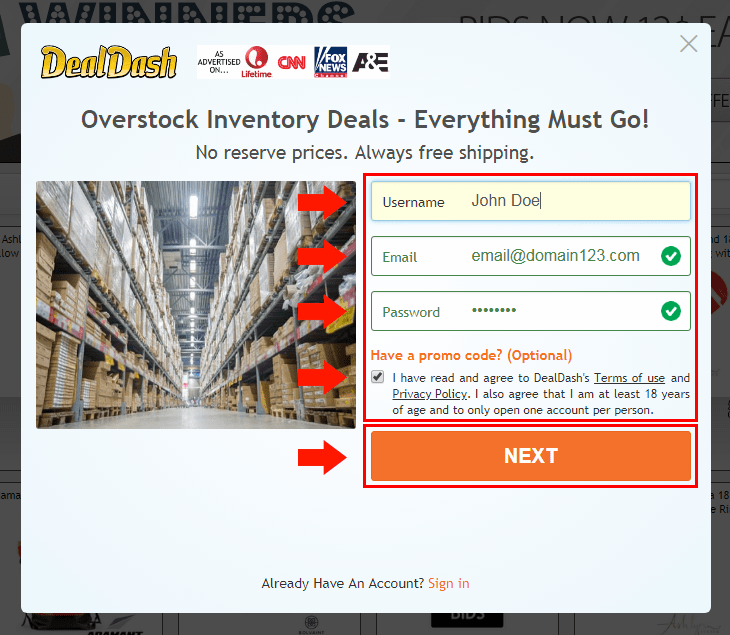 If you decide to try DealDash, here are some tips that may help you win auctions and win merchandise at a discount. DealDash allows bidders to see the other bids on auctions in which they are participating. You can keep track of bidders who seem to be always winning to study their strategies. Also, you can check the winners' page to find out how much certain items were won for in past auctions. You should conserve bids, so they are not wasted. Most bidders place bids on items within the last few seconds to try to win before others can bid. However, by using Bid Buddy, you can still get bids in during the final few moments to try to win auctions. The more you bid, the more you will end up paying if you win the auction, so conserving bids will save money. Previous articleLookfantastic Review – A Real Contender Or A Waste Of Time? Letgo Review – a Good Place to Sell or Buy Products? The Ultimate Quibids Review – Things You Need to Know, Scam or Legit?